RATE project – How old is the earth? Back in August, I wrote about the RATE project and its extraordinary claim that nuclear decay rates had been accelerated by a factor of a billion during the Creation Week and Noah’s Flood. We also saw that they had reported some extraordinary problems with this hypothesis — notably, that it would have released enough heat to boil the oceans and melt the earth’s crust many times over. Yet despite this, they were confident that these problems could be resolved, and at the same time they claimed that they actually had evidence to support their hypothesis. One of the claims that they made is the sixth of Answers in Genesis’s ten best evidences for a young earth — that radioactive rocks contain too much helium. Before I get into the technical details of this claim, I’ll start by making one very important point. Complex claims are easy to get wrong, difficult to get right, easy to fudge, and difficult to fact-check. The same principle applies to any area of science. The more complex it is, the easier it will be for mistakes and fallacies to creep in, whether by accident or design, and the harder it will be to spot them. Accordingly, such claims will need to be scrutinised all the more rigorously. I am willing to bet that if you presented Dr. Humphrey’s research in detail to the geology department at any university, you would find a handful of geologists at most that would be able to follow the arguments without spending several hours reading up on the methodology. The modeling of helium diffusivity in zircon grains is a very complicated, math-intensive process that requires a particular expertise to apply properly. This method was developed only recently (hence the lack of data before 1999), and has been studied by a relatively small number of researchers over the past 10 years. The results can be extremely useful to geologists, and so hundreds of published studies have made use of helium data from zircons, but very few people are familiar with the laboratory procedure. The upshot of this is that a study such as this one will need to be peer reviewed to within an inch of its life by subject matter experts — aggressively, mercilessly and relentlessly, and all the more so given that it is being made in support of an extraordinary claim about accelerated nuclear decay that would easily qualify for a Nobel Prize if it had any merit. To an untrained observer, this can appear petty and nitpicking, but it is essential. Anything less would also give a free pass to anti-vaxxers, homeopathy, astrology, water divining, reading tea leaves, and tobacco companies trying to prove that smoking does not cause cancer. Do zircon crystals contain too much helium? As we’ve already seen, zircons are tiny crystals of ZrSiO4 whose properties make them particularly well suited to uranium-lead radiometric dating. When uranium decays to lead, it releases helium in the form of alpha particles, which then get trapped in the crystalline structure. Over time, these are expected to diffuse out of the zircons and into the surrounding rocks. If you know how much lead is in the zircons, you can calculate how much helium was produced by the decay. This value is called Q0. You can then measure the amount of helium that is left, Q, and calculate a ratio, Q/Q0, which tells you how much must have diffused out. The RATE team studied some zircons that had been retrieved from a borehole in Fenton Hill, New Mexico, and concluded that this value, Q/Q0, was higher than it should have been given the zircons’ radiometrically determined ages of 1.5 billion years. They then came up with a “Creation model” that attempted to better explain the data. This model started off with a burst of accelerated nuclear decay giving rise to modern levels of uranium, lead and thorium, and an initial helium concentration, Q/Q0, of one. They claimed that when all the different values were plugged into their model, the final value of Q/Q0 = 0.58 indicated an age of 6,000 ± 2,000 years. This is pretty attractive to YECs, because very, very few of their claims of evidence for a young earth attempt to pin down its age precisely in this way — most of their other arguments merely attempt to discredit conventional old-earth results. Noble gas diffusion rates in crystals depend on a large number of different factors, including temperature, pressure, anisotropy (different diffusion rates in different directions), edge effects, and defects and impurities in the crystal structure. The theoretical calculations are complex, and it is very difficult to study it experimentally as well. The RATE team’s study makes several simplifying assumptions. There’s nothing unusual or untoward about this: many models in physics do the same, otherwise the maths would be nightmarishly complicated. However, when you do so, you need to demonstrate that the simplifications concerned would not significantly affect your results. The RATE team claimed that their simplifications would only affect the results by “a factor of two or so,” or “an order of magnitude or so.” However, they did not provide any calculations or other evidence to back up their claims that the effects were as insignificant as they claimed. Furthermore, factors of two or so, or of an order of magnitude or so, are most certainly not trivial. It only takes a handful of them to mount up to the difference between thousands and billions. These results suggest that the anisotropic nature of He diffusion at temperatures near the closure temperature should be considered in future diffusivity experiments. Furthermore, care should be taken when making geologic interpretations (e.g., exhumation rates, timing of cooling, etc.) from this thermochronometer until the effects of anisotropic diffusion on bulk ages and closure temperature estimates are better quantified. Does it stand up under pressure? Another simplifying assumption made by the RATE team was that diffusion rates would not be significantly affected by pressure. Again, at the time of the RATE project, the exact effects of pressure on helium diffusion rates in zircons had not been studied. In defence of this assumption, they pointed to some studies of argon diffusion in glasses, such as rhyolite obsidian, and gives some plausible-sounding, but nonetheless hand-waving, reasons why helium diffusion in zircons should be affected to a much lesser extent. However, Kevin Henke, a geology professor from the University of Kentucky, responded to this claim by pointing to a study by Dunai and Roselieb (1996) that showed that at high pressures of 250 bars, helium would take tens to hundreds of millions of years even at high temperatures (700°C) to partially diffuse out of garnets. He also pointed out that garnets have much more in common with zircons, being “hard” silicate minerals, and consequently that this would be much more representative of zircons than rhyolite obsidian. Did the RATE team stick to the scientific method? After consulting with Dr. Gentry, we have corrected, in the fourth column, two apparent typographical errors in the corresponding column of his table. One is in the units of the column (which should have been 10-9 cc/μg instead of 10-8 cc/μg); the other is in sample 4 of that column. The crucial fractions in column five were correctly reported, as we have confirmed with our data. This is a very important question. One does not simply “correct typographic errors” in scientific results. The original lab notes would have to be consulted, independent evidence would need to be provided that these corrections really were warranted, and if the integrity of the data could not be established, the whole data set would have to be thrown out and the experiment re-done. In the absence of such independent confirmation, “correcting typographic errors” in this manner is an unacceptably sloppy shortcut. To their credit, they acknowledged that this was what they had done; if they had not done so, it would quite possibly have constituted scientific fraud. How not to respond to peer review. Gary Loechelt proposes a more realistic multi-diffusion domain model which shows that the measured values of Q/Q0 are consistent with the 1.5 billion year age of the zircons. He has also written a reply to the RATE team’s response to his critique. Kevin Henke provides the most detailed and thorough critique of the RATE project’s claims. His tone is scathing at times, and he does spoil it somewhat by attacking their religious presuppositions, but many of his points are valid ones that do need to be addressed. Timothy Christman points to other studies of helium diffusion in zircons which give completely different results from the RATE team’s findings. Rodney Whitefield points out further ways in which the data reported by the RATE team does not support their conclusions of excess helium. Russell Humphreys responded to the critiques of the RATE team’s research in an article on trueorigin.org in April 2005, another article on trueorigin.org on January 5, 2006, and again in an article on creation.com in November 2008. Gary Loechelt replied to these responses in April 2009, and Henke’s latest revision of his critique, which also addresses the RATE team’s responses, is dated June 20, 2010. I am not aware of any later responses from the RATE team. The first thing to notice about Henke’s issues is how few of them there really are. For example, of the fifteen items above, six of them (4, 5, 6, 8, 9, 12) boil down to only one issue, how much helium was deposited in the zircons. Several other items repeated themselves similarly. The second thing to notice is how peripheral they are. Not one of them has any chance of solving Henke’s real problem: how to keep helium in leaky minerals for over a billion years. Third, notice how petty most of them are. One of my challenges in answering those charges was to find different words describing their basic character: “molehill, not a mountain … distinction without a difference … haggling … ridiculous quibble … inconsequential … majoring on minors … irrelevant”. Eight of the items (1, 2, 3, 6, 7, 10, 11, 12) fall into that class. Three points are of note here. First of all, it isn’t clear how the six issues he cites as boiling down to one really do refer to the same issue. They may have the same end result in common, but they all refer to different errors in determining that end result. Furthermore, there are numerous other errors that he does not even attempt to address. Dr Henke’s list of unanswered questions includes no less than sixty-six that are of a purely technical nature. Secondly, Humphreys provides no calculations to prove that the objections really are as petty and inconsequential as he claims that they are. As we have seen from Reich et al and Dunai and Roselieb, pressure and anisotropy alone are sufficient to bring us right back from thousands to billions. In any case, even if the other objections really are “only a factor of two or so” or “only an order of magnitude or so,” he needs to demonstrate that their cumulative effect really would still be as inconsequential and petty as just considering them individually. Thirdly, anyone who has had any significant experience in science or technology will tell you that even seemingly “petty and inconsequential” mistakes can completely undermine the validity of your results. As a software developer, I get confronted with such examples several times a day. To dismiss critiques as “petty and inconsequential” in such a cavalier manner encourages Christians to adopt a sloppy and casual attitude towards science and technology — and in many other areas of science, such an attitude can — and does — kill people. No matter how “petty” and “inconsequential” you think it is, there are only three appropriate responses in science to a peer reviewer’s criticisms. Either fix the problem, prove that it is as inconsequential as you think it is, or retract your claim. The RATE team’s responses do none of these. In any case, an error of ±2,000 years in a final result of 6,000 years is an error of 33%. This is an enormous error. It is far, far larger than anything seen in conventional radiometric dating, in which error bars can be tighter than one part in a thousand. Furthermore, it clearly does not account for the multiple “factors of two or so” or “an order of magnitude or so” for the simple reason that just one “factor of two or so” means an error of ±50%, which is one and a half times as large. Bearing in mind that we are dealing with extrordinary claims about accelerated nuclear decay that would easily qualify for a Nobel Prize if they had any merit, results with errors this large are simply far too weak to be credible. Even if the study did have some merit, it is not at all clear how it supports the idea of accelerated nuclear decay in the first place. In fact, given the RATE team’s own admission that accelerated nuclear decay would have generated massive quantities of heat, this would have expelled most if not all of the helium from the zircons anyway, and so the fact that we find any helium in zircons at all is pretty strong evidence against the RATE team’s own model. Since the RATE project, there have been numerous other studies of helium diffusion in zircons. As far as I am aware, none of them have confirmed the RATE team’s findings. The figure of 6,000±2,000 years for the age of the zircons appears to be based more on miscalculation, circular reasoning, and improper data handling practices than on the actual age of the earth. Radiometric deniers love to point out examples of cases where different dating methods give different results on the same rock strata. The most comprehensive attempt to catalogue these that I’m aware of is an article by John Woodmorappe in the September 1979 issue of the Creation Research Society Quarterly entitled Radiometric Geochronology Reappraised, which lists about 300 examples that he had culled from the scientific literature. Now anomalous results do happen from time to time, and lists such as these do look pretty impressive, but they greatly exaggerate their frequency, extent and significance. Here are a few points to bear in mind. 1. Discrepancies are the exception, not the rule. As we saw last week, the number of radiometric results in the scientific literature runs into the hundreds of thousands, and quite possibly even into the millions. This being the case, three hundred bad dates represents only a tiny fraction of the overall data. How many results overall are discordant? Without doing an exhaustive literature search, which would take forever, it is hard to tell. However, one thing is clear: when radiometric dating is correctly applied, they are very much in the minority. This Talk Origins article cites geochronology expert Brent Dalrymple, an expert in radiometric dating with lots of real-world experience, as estimating that only between 5% and 10% of radiometric results are discordant. The article doesn’t explain how he arrived at that figure though. A more detailed picture comes from this account by geology professor Joe Meert (scroll down to the section “A brief discussion regarding the integrity of radiometric dating”), in which he records a discussion with some YECs on the subject. The figures that they cited were, unsurprisingly, higher, claiming that up to 15-20% or so of dates were discordant. However, he cited fifteen years of his own research, in which he found that fewer than 5% of his results were anomalous, and that each and every one of them had a reasonable explanation. Even if the figure is as high as 20%, this leaves a serious question for radiometric denialists. Why do so many of the hundreds of thousands of results in the literature show little or no discordance? This would never happen if radiometric dating really were consistently unreliable, and certainly not if it were so off-base that it could not distinguish between thousands and billions. In any case, there are certain important data sets that show little or no discordance — specifically, meteorites and lunar rocks returned from the Apollo missions. Meteorites in particular are very, very consistent in showing ages between 4.4 billion and 4.6 billion years by up to six different methods. Because they have very simple geological histories and have not been subjected to weathering, erosion, and metamorphic and tectonic processes found on Earth, there is little or no scope for “evolutionists” to fish around for alternative interpretations in order to get the results they want, as creation.com claims to be standard practice. Furthermore, these data sets are relatively small (a few hundred or so samples), so allegations of cherry-picked results are completely unrealistic. 2. Showing that one method fails under specific conditions does not prove that all methods fail everywhere. There are over forty different isotopes used in radiometric dating. Each of them has a different half-life, applies to a different range of ages, involves different experimental procedures, and works in different situations on some minerals but not others. Let’s say, for example, that you tried to use carbon-14 dating on a traffic cone, and got an age of 5,000 years. This is quite a plausible result, because traffic cones are made of plastic, which has been heavily processed from oil deposits and will therefore have been heavily contaminated by significant amounts of modern carbon. However, what does this tell us? Simply that carbon-14 dating doesn’t work on traffic cones. It doesn’t tell us whether or not it works on bones, wood, or ancient seeds. And it certainly doesn’t tell us whether or not uranium-lead dating works on zircon crystals in granites. Before radiometric dating techniques can be used in the field on new types of materials, they are first tested against samples of those materials whose ages are already known. Many of Woodmorappe’s discordances you read about are the results of these preliminary experimental tests. It is dishonest to cite these preliminary tests as evidence that field results using well-established methods are also unreliable. 3. Showing that a method fails when pushed to its limits does not prove that it fails everywhere. Take, for example, this report of an attempt to date some lava from a lava dome that formed on Mount St Helens in 1986. The potassium-argon “ages” reported ranged from 0.35 million years to 2.8 million years, which the YEC researcher, Steve Austin, described as “preposterous.” In reality, it was his methodology that was preposterous. Samples less than 5 M.Y. old, or containing less than 0.1%K will incur a 50% surcharge, reflecting the special care and additional analyses required. We cannot analyze samples expected to be younger than 2 M.Y. Geochron Laboratories did not have the advanced state-of-the-art equipment needed to process samples that young, and consequently, contamination and “memory effects” of lingering argon from previous analyses would have been a very real issue. The half-life of 40K is 1.25 billion years — roughly a thousand times greater than the ages reported by Austin. This study was the equivalent of using a weighbridge to measure out flour, sugar and eggs when baking a cake for a family of four, then claiming that weighbridges are unreliable when it comes out all mushy. I’m sorry, but this is called “gaming the system,” pure and simple. 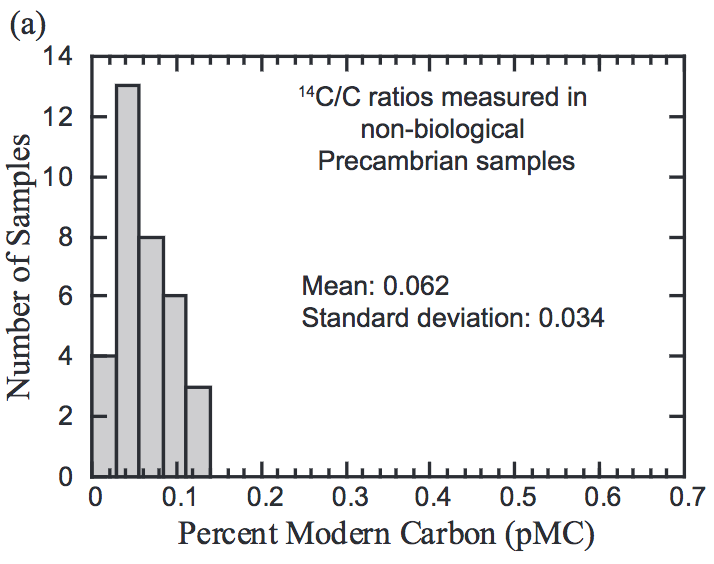 Another example here is the RATE project’s claims of discovery of primordial radiocarbon in ancient coals and diamonds. 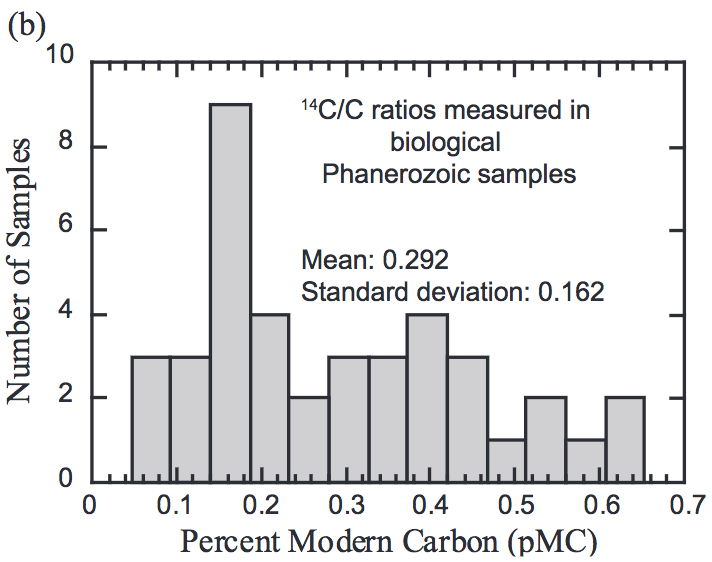 The quantities discovered were very low, close to the limits of the capabilities of many radiocarbon labs, and showed clear patterns that were consistent with contamination, with heavily processed samples showing significantly more 14C than unprocessed ones. Although the RATE team claimed to have taken great care to take contamination into account, radiocarbon experts such as Kirk Bertsche noted that the procedures they followed were incorrect. 4. Discrepancies of a factor of two or three do not prove that all methods must be out by a factor of a million or more. About three quarters of the discrepancies on Woodmaroppe’s list come within a factor of two of the expected result, about 90% within a factor of three, and more than 97% within a single order of magnitude. Furthermore, about two thirds of the time, the dates reported are too small. This does not help the Literal Six Day Young Earth timescale, which requires the dates reported to be consistently too large by a factor of between a thousand and a million. A factor of a million is a colossal error. It is like demonstrating that the whole of London would fit into a rucksack, or that you could buy a four bedroom house in Chelsea for five pounds, or that the life and ministry of Christ recorded in the Gospels happened in the space of fifteen minutes just yesterday afternoon. 5. The differences are unsurprising, well understood, and useful. Different results from different radiometric methods are not unexpected, given that many rocks have had a complex history. In fact, the differences usually provide a lot of useful information that extends well beyond the ages of the samples. One condition which results in different dating methods giving different results is when a rock formation such as granite takes a long time to cool. This is because radiometric dating measures the time since the rock cooled below the “closure temperature.” Closure temperatures can be determined experimentally and are different for different radioisotopes. Consequently the differences in radiometric ages can tell us how long the rock took to cool. Far from falsifying radiometric dating, different results from different methods provide additional information about a rock formation’s thermal history as well as its age. This extra information is of particular importance in oil exploration, where geologists need to know the thermal history of the oil deposits as well as their ages in order to determine whether they’re going to yield anything useful. Woodmorappe claimed, in response to a critique to his list, that cooling explanations are just a “rationalisation,” and that the imbalance between overestimates and underestimates was evidence of cherry-picking by the scientific community, with “nonsensical” results more likely to be withheld from publication. We shall see next week that his allegations of cherry-picking have no merit whatsoever, but for now it should be clear that these explanations are no mere “rationalisation,” but are in fact individually testable. 6. Some claims of discordant dates are blatantly dishonest. One of the articles that Woodmorappe cited was that of a Rb-Sr isochron that allegedly gave an age of 34 billion years — seven times the age of the earth and two and a half times the age of the universe. This is not an isochron. Anyone who knows anything about isochron dating will be aware that you need all the points to lie on a straight line in order to get a valid date. When they don’t, the only correct interpretation of the graph is “undateable due to contamination and leakage,” and the 1.09 billion and 34 billion year lines were purely there to illustrate the fact. For what it’s worth, this is a variant on what scientists call “quote mining” — taking a particular quote completely out of context and misrepresenting it as saying something that it is not. A charitable view here would be merely that Woodmorappe had misunderstood the graph, wasn’t getting his facts straight, or was perhaps being a little bit careless, but scientists who get quote mined do not take such a charitable view. They consider it to be a form of lying. Discordant dates do not prove what YECs claim that they prove. There is a vast difference between showing that something doesn’t always work and showing that it never works, and similarly, there is a vast difference between showing that something can occasionally be out by a factor of two, and showing that it is consistently too large by a factor of up to a million. Disagreements between different dating methods may give us leave to take individual results with a pinch of salt. This may have some bearing on subjects such as the Shroud of Turin, or the occasional archaeological discovery relating to Bible times. But they present no challenge whatsoever to the overall corpus of data as a whole. In particular, they fall far, far short of falsifying the geological column with its display of a general progression of species through the ages, let alone demonstrating that all radiometric results could plausibly be out by up to six orders of magnitude. Radiometric dating still presents an insurmountable barrier to the young-earth timescale and the discordances highlighted by the young-earth literature barely put a dent in it. Two weeks ago, we saw that the evidence for the age of the earth can not be based on presupposition or worldview because this does not account for evidence from the oil industry, which has to remain strictly independent of such matters for purely financial and economic reasons. Nevertheless, young-earth creationists still tell me that science must “fit Scripture.” By this, they mean their young-earth interpretation of Scripture, because when it comes to the age of the earth, Scripture leaves a lot open to interpretation. But if you want to interpret science to fit into a six thousand year timescale, we know exactly what that involves, for the YEC organisations have spent vast sums of money attempting to do precisely that. RATE stands for Radioisotopes and the Age of The Earth. It was a research project run by the Institute for Creation Research and the Creation Research Society from 1997 to 2005, which sought to answer the question: if the earth is six thousand years old, why does radiometric dating consistently give results that are much older? It was funded by $250,000 from the Institute for Creation Research, and more than $1 million in donations. The RATE team admitted that there is overwhelming evidence that hundreds of millions of years’ worth of nuclear decay has taken place since Creation. This was certainly ground-breaking for young-earth claims, because they had always insisted up until that point that “evolutionists” were throwing away any results that didn’t conform to their “uniformitarian presuppositions” — in effect, claiming that radiometric dating was no more than a fraudulent exercise in cherry-picking random numbers. Rather than admitting that this meant the earth was old, however, they decided that nuclear decay rates must have been up to a billion times higher in the past — notably, during the first two days of Creation Week, and during Noah’s Flood. The RATE team set about looking for evidence to support their hypothesis, and after eight years they came up with four studies that they claimed did so. I will examine the details of these claims in future blog posts, but for now all you need to know is that no independent peer reviewer has ever found their claims satisfactory, no other researchers have ever replicated their findings, and the subject matter experts who reviewed their work, many of whom were evangelical Christians themselves, documented numerous flaws of a purely technical nature, many of them serious, and all of them, when combined together, more than sufficient to falsify their entire conclusions. But it was the RATE team themselves who noted the biggest problem of the lot. Radioactive decay generates a lot of heat. So much heat, in fact, that if you squeezed all the observed decay into just a fraction of six thousand years, you would raise the temperature of the earth to 22,000°C. Twenty. Two. Thousand. Degrees. Centigrade. They admitted that neither conduction, nor convection, nor radiation, could have removed this much heat fast enough, and furthermore that any cooling process would have had to cool granites much faster than water to avoid the oceans from freezing over. They speculated about one or two possible solutions to the problem, but these also involved proposing equally absurd new laws of physics which are not supported by any evidence whatsoever either. In the end, they said that the removal of heat must have been supernatural, but admitted that the problem was nevertheless unsolved. Despite this extraordinary contradiction, the RATE project has been marketed as a success, with books, DVDs, and conferences proclaiming accelerated nuclear decay as a rock-solid fact, supported by “overwhelming” evidence. The heat problem is casually dismissed as merely a minor issue — if in fact it ever gets mentioned at all. Accelerated nuclear decay is now touted as the cornerstone of the YEC objections to radiometric dating. The crown jewels of young-earth research? If you’re a young-earth creationist, struggling to figure out why even many born-again, Spirit-filled Christians find the LSDYEC position an embarrassment despite having a high regard for the Bible, this is why. The sheer absurdity of the RATE team’s willingness to downplay the 22,000°C heat problem is mind-boggling. Reading the conclusion of the RATE report, it is almost impossible to believe that it is genuine creationist apologetics, and not some sort of wild atheist parody like the Flying Spaghetti Monster or Last Thursdayism. Even one young-earth creationist friend I spoke to about it thought it was some kind of hoax to “discredit creationism.” 22,000°C is four times as hot as the surface of the sun, and hot enough to vaporise the entire planet. But this is no parody, nor is it the idea of some fringe armchair physicist, nor can it be excused as shoestring research that was only flaky through being under-funded. As far as young-earth research goes, this is about as mainstream as it gets. The RATE project was the most expensive, extensive and thorough research project ever carried out by YEC scientists. They threw eight years, six of their best physicists and geologists, and more than a million dollars at the problem. It has been endorsed by all the major YEC organisations. It represents the very crown jewels of young-earth science. This is what happens when you try to make scientific evidence fit conclusions that it does not support. The consensus of professional geochronologists is that the earth is 4.54±0.05 billion years old, and any challenge to that figure needs to be based on sound methodology, honest reporting of results, and careful scrutiny through a process of independent peer review. It simply isn’t honest to make up science fiction to try and fit the conclusions you want to get. It does not honour God and it does not uphold the Bible. On the contrary, it makes a mockery of it.